The University of Wisconsin's IceCube neutrino detection system has been quietly operating amid Antarctica's barren tundra for more than four years now. In that time, the fledgling detector has captured more than 100 cosmic neutrinos, many of which originated far outside our Milky Way galaxy. And if project leaders get their way, its imaging quality is about to improve by an order of magnitude. 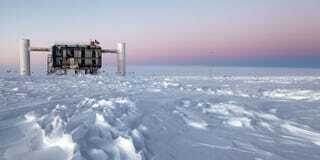 The IceCube neutrino detector has been in operation since 2010. It utilizes kilometer-long strings of sensitive optical sensors buried in regular 125 meter intervals across the ice sheet to catch a glimpse of rarely interacting cosmic particles known as neutrinos. The individual sensors operate much like a digital camera's pixels do, lighting up when exposed to incoming energy to create a composite view of the area's neutrino strikes. Well, technically, the incoming neutrino interacts with the surrounding ice to produce a muon. As the muon travels through the ice, it generates a tiny shockwave within the frozen lattice and emits Cherenkov radiation, which one of the 5,000 or so detectors actually senses. "The more you have, the clearer the picture gets," University of Wisconsin physicist Francis Halzen said as he argued for an expansion of the program at a recent workshop. "To see several neutrinos come from the same source, you are likely to need well above one thousand." Speaking of a clearer picture, the research team recently discovered that the ice sheet they're operating on is optically more clear than they originally believed. This means that the current 125 meter spacing between strings could be effectively doubled to 250 meters, allowing the team to capture a larger image without much added expenditure. And to compensate for the loss in sensor density, the team hopes to add as many as 120 new strings over the next six years, installing 20 of them annually with an updated version of their custom hot-water drill.